Point Line Flow: Landscapes of Energy vol. 1: Visible and Invisible. Landscapes of Energy vol. 1: Visible and Invisible. The first guest post by Luca Silvestrini, renewable energies engineer, based in Palermo, Sicily, introducing the subject of seeing the new landscape of renewable energies. 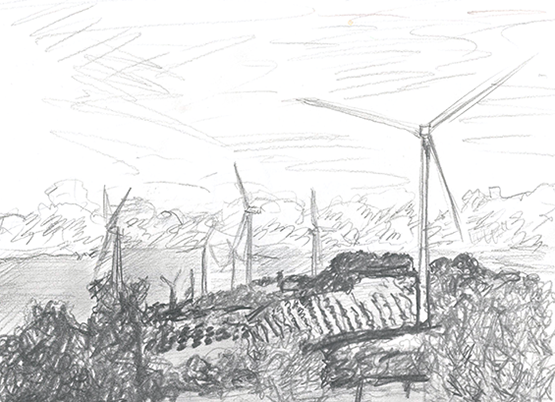 Writing from Sicily and working in this area, I often am confronted with this topic: many people feel the Sicilian landscape is too beautiful to be “damaged” by wind or solar farms. Some local politicians complain too. First of all, we should all have in mind that energy efficiency (i.e. redesigning the way houses are built, factories work, transportation means move), much less visible than any electricity generation device, is at the same time much more important and, often, cheaper too. Having said that, what is the visual and mental impact of seeing a line of 80 m high wind turbines in the almost empty Sicilian countryside? But, one should ask himself about the “alternative” source of electricity which, in this case is natural gas plants or, in some other cases, coal or nuclear plants. Centralised production, of course, gives the political advantage of high control and potential lack of transparency over the facility. More importantly for this blog, these complexes have a high visual impact concentrated only on a small part of the landscape. How much energy will this wind plant produce? How much is that compared to the City/Region/Nation’s needs? Which alternatives do we have? People that never in their life realized how important electricity is, because they always took it for granted, in front of these new presences in the landscape begin to think about the energy. Another, more landscape friendly example is a photovoltaic system on a family’s rooftop. The more distributed energy production becomes, the less aggressive it is to the landscape. Also, the people start thinking anew about energy as something that is not coming straight from Heaven, and become more conscious about that energy, about its limitedness. Families will learn what time is better to use the dishwasher (maybe even estimate how much it consumes) and, more importantly, how much energy they can produce in one sunny day. On the other hand, at the present moment we are very concerned about something we do not really see: money. When it comes to paying the electricity bill we often complain. We just don’t realise that if most Governments are giving high subsidies to green energies, they still give much higher subsidies to dirty energies. If they didn’t, and if the external cost of pollution was correctly accounted for, our real bills would have to be much higher, and thus far more perceptible. To try to stop global warming, and give some home to the human race, we should first become more conscious and knowledgeable about how we use energy: learning to see and under stand renewables is a necessary step in the right direction. Hello world, this is a collaborative blog, initiated by mirko nikolić, in which the primary matters of concern are space and time, how they are perceived, conceived and lived through arts, media, architecture, and other ways of producing spatio-temporalities. On through against the Screens of Silver. Along in with Mårten Spångberg's 'Epic'. Tracking with Other(s). Practising Ecological Thought in Times of the Internet of Things. Figures and Grounds of the 'Conditions of Mediation. Phenomenological Approaches to Media, Technology and Communication'. Spheres Blurs Triangles Clouds Assemblies. Sketches about the Present Future. Landscapes of Energy vol. 3. Invisible Energy. Landscapes of Energy Vol. 2: Camouflage, Transparency, Chromatic Fancy. Souvenirs Maps: Casual Cartographic Encounters and Derivés. Geographies of Noir Vol. 3. Landscape (Cityscape) vs. Map. Geographies of Noir Vol 2. Tale-Telling Within The Night. Geographies of Noir Vol. 1. Into the Noir Spatiality. Map Your Moves. Move Your Maps. How to Turn a Map into a Fable. Disorientation, Arbitrary Framing, Monochrome and Trees. Civil Society 2.0 Under Construction. Social/Political Activism on Share Conference 2012. Mirko Nikolic. 2011. Simple theme. Powered by Blogger.